I love creating commissioned artwork for your personal enjoyment, and original custom portrait paintings! If you are considering the enjoyable process of commissioning your painting here are some of the details to consider. Before I start any painting, we have our conversations about your thoughts about what your subject matter will be along with other desires you have for your painting. Then I start creating a custom portrait drawing to scale of your ideas. This sketch shows all the details and size of your painting then we can critique and make any changes if necessary. I pride myself in the pencil sketch to scale, for this sketch is the blueprint for your commissioned painting. The technique that I use to build the layers of pastel pigment and detail for each painting is accomplished by painting in the morning hours, afternoon, evening hours, on sunny and cloudy days so that the lighting is virtually built into the painting. The painting will look great in many different lighting situations so no direct overhead lighting will be necessary. The time I need to create for smaller paintings is three months and up to six months or more for larger paintings. Browse my gallery page and testimonials to view my style. Custom portrait paintings begin with a personal consultation where we talk about your ideas which may be a few conversations. To give you a reliable quote for your Original Pastel Painting other details must be precisely discussed such as; the size, subject matter, colors and the concept of your painting, where the painting will hang, pictures, personal items and usually two sessions together with the subject of about 45 minutes each. I also include critiques during the process of the painting, so the result is precisely what you desire. Once we agree on a quote, I usually ask for a comfortable deposit. The commission includes all conversations, emails, critiques, the painting, and framing. If I have to travel there may be travel expenses that would be additional. The subject matter is the all-important consideration. Whether the original painting is for a corporation or something more personal like a custom portrait painting or custom portrait drawing I can create a wide range of subject matter. This website is a portfolio of works and you can review my galleries for a sense of my style. However, every type of subject matter is open for discussion. I look forward to hearing about your ideas. about the art on my site call or email me directly. It would be my pleasure to speak with you! 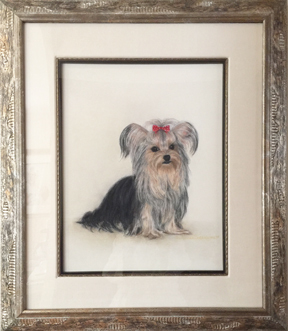 L.A. CLINE is a multifaceted artist that loves to create many different types of subject matter using the pastel medium. For the Artist everything in our world is a portrait, People, Pets, Wildlife, Landscapes, Flowers and more! In addition to the many family, pet and wildlife portraits L..A. CLINE has portrait paintings at the The Lawson E. Thomas Courthouse Center commissioned the Artist for create two portraits one of the Honorable Judge Feder and the other of Lawson E. Thomas in Miami, Florida. Southern Wine and Liquor of Miami Florida also commissioned the Artist to create a portrait of one of their long time employee’s whose portrait was hung in the Southern Wine and Liquor Lecture Room and Florida International University, in North Miami. The Third Court of Appeals has a portrait of their Chief Judge painted by L.A. CLINE in their courtroom. Sidney M. Aronovitz Courthouse now houses his portrait created by L.A. CLINE. L.A. CLINE submitted a portfolio of her Judaical Portraits that was accepted by the Smithsonian Institute’s “Living Artists File, at the American Art and Portrait Gallery Library in Washington DC. This file and others can be viewed by the public to learn about our American Heros and the Artists that created their images. Locally the Lauderdale Yacht Club gave the Artist the Peoples Choice Award for her art at the 7th Annual Fine Art Show. More recently the Nestler Poletto International Realty featured the Art of L.A. CLINE in their Corporate Office in Boca Raton Florida. You can view L.A. CLINE’s art at The Heart of Delray Gallery and attend the monthly Art Walk of Delray and meet the Artist. L.A. CLINE has also been accepted by the Boca Museum Artists Guild as a participating signature member with works displayed in the up coming show at the December 14th, 2018 reception. L.A. CLINE has been a long time member of the American Pastel Society of New York and has been working with pastel for over 40 years.